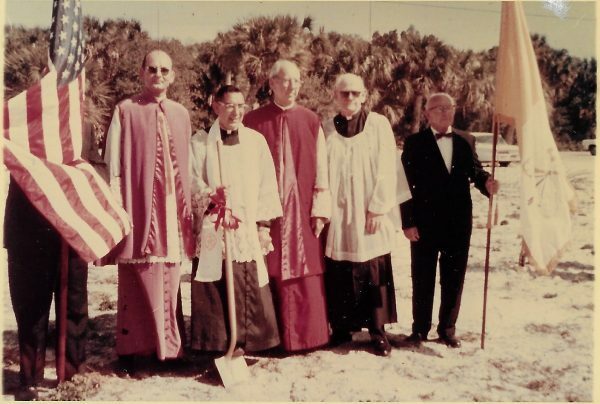 Under the leadership of Archbishop Joseph P. Hurley, who served as the Bishop of St. Augustine from 1940 to 1967, the population of Catholics in the State of Florida grew so much during that time that the Diocese of Miami was created. Catholic schools and education were of great importance to him, so after World War II, he helped to promote the construction of more than 100 Catholic schools. Locally, those included St. Martha’s School, Incarnation School and Cardinal Mooney High School in Sarasota, and Epiphany School in Venice. Also during that time, there were 74 parishes organized in the state, one of which was St. Michael the Archangel Church here on Siesta Key. 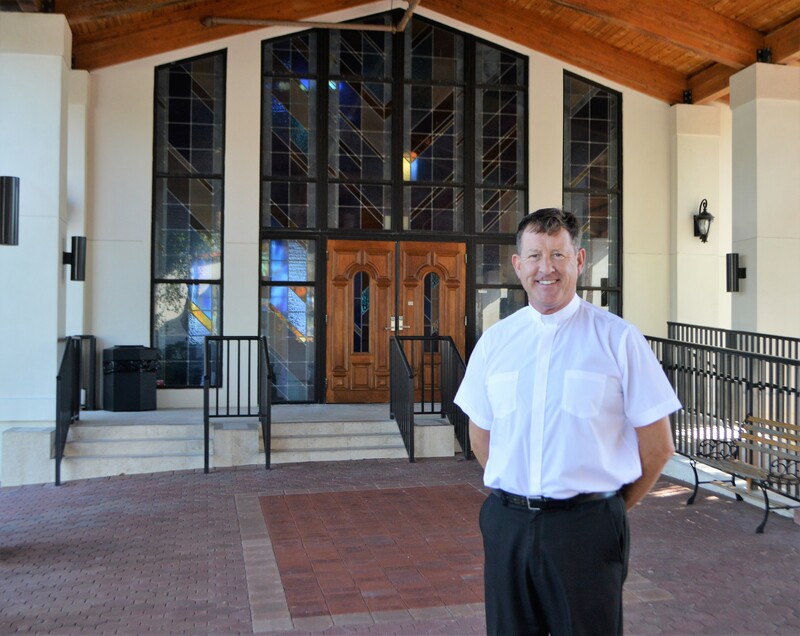 Father Michael Cannon is the pastor of St. Michael the Archangel Catholic Church. Father Michael Cannon, who has been the pastor at St. Michael for the past three years, says that the congregants initially began assembling for worship at the Out of Door Academy, but were hoping to build a chapel of their own. The St. Michael Rectory was constructed in 1969. Considering its previous use, there was quite a bit of work to be done on the land before a church could be built. Sand was brought in from the Gulf of Mexico, just a couple of blocks away, to act as fill, but before a Chapel could be built, more money had to be raised. In 1958, there were only around 40 Catholic families living on Siesta Key, according to notes Father Daley made at the time. As a matter of fact, Siesta Key had a year-round population of only 5,000 residents that year. But Father Daley quickly organized key committee members and volunteers to launch the Incarnation-St. Michael’s Building Fund, which they used to raise money to erect a new chapel. Thomas Madden, an architect from Miami, was hired to design both St. Michael’s and Incarnation Churches. The design for the St. Michael Chapel was 50 feet wide and 94 feet long, and could seat 500 parishioners. The wall behind the alter was made of wood, by a Siesta Key carpenter, with wood provided by the Parish. Its design was meant to be easier to expand, if needed. The groundbreaking ceremony for the new St. Michael Rectory in 1969 was a celebratory affair. In addition to the Rev. Louis Bentiuoglio (St. Michael pastor), attendees included the Right Rev. Msgr. George Cummings and the Right Rev. Msgr. Charles Elslanter. 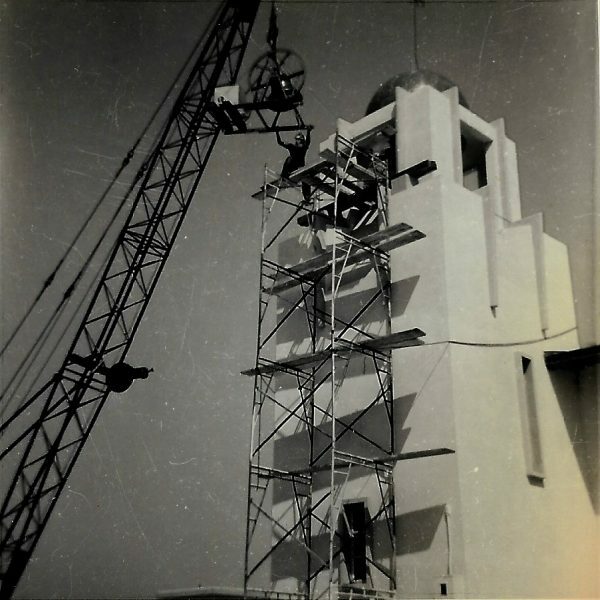 Construction on the church was completed in 1959, and on January 10, 1960, it was officially dedicated. When Father Louis Bentivoglio “Father Louie,” arrived as pastor in 1966, St. Michael still held a “Mission” designation, which is meant to be an outreach location of the larger Incarnation Parish. But by 1968. 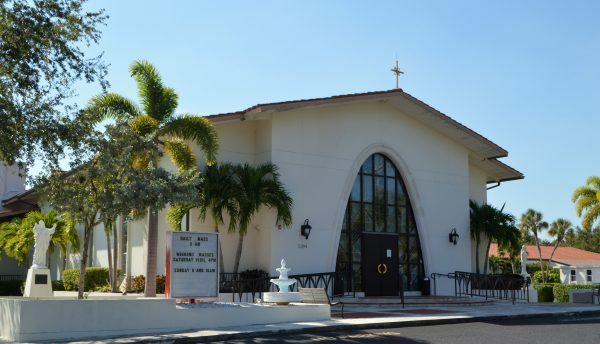 St. Michael was officially named a Parish, so could even better serve its Siesta Key parishioners. Dr. Louis Vodila, a 92 year-old former dentist, was a member of St. Michael when it changed from Mission to Parish. Father Daley suggested a blue dome be added to the top of the Bell Tower, after he saw one on a landmark restaurant on U.S. 41. Dr. Vodila’s and his fellow congregants’ fundraising efforts paid off. 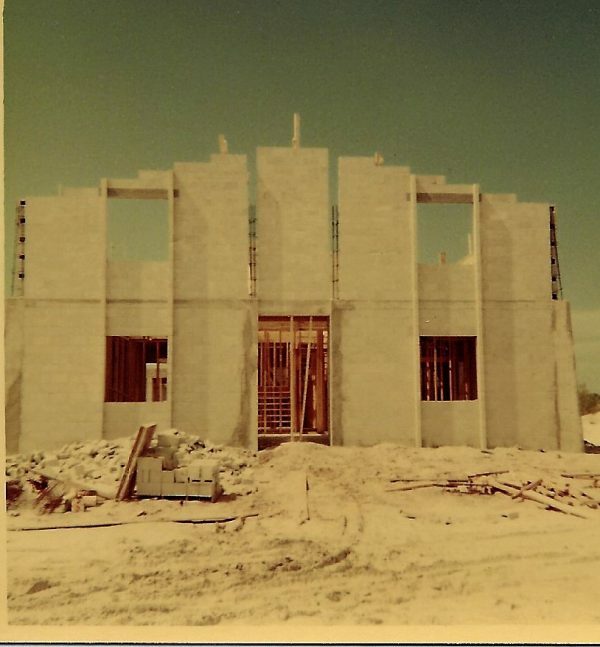 With $38,000 in pledges and $15,000 cash in hand, Father Louie sought and received approval to move ahead with the construction of the new Rectory, and by the time it opened on October 4, 1969, it was completely paid in full. In late 1970, Father Louie requested permission to raise funds for the new Parish Center. Construction and dedication of the building were both held in 1974. Though Dr. Vodila now lives on his ranch in Myakka City, he still attends worship services at St. Michael. Membership at the church continues to grow, and sometimes services are so packed that the crowd overflow moves into the Parish Hall. Unfortunately, the church won’t be able to accommodate those extra parishioners during this holiday season. In June, an overflowing toilet left undiscovered for some time during Vacation Bible School caused extreme flooding in the Parish Hall. But Father Michael remains optimistic that just as it always has with St. Michael, God and His faithful, will provide. Next Next post: Who will buy the Bank of America building on South Siesta Key?